What can we say about an industrial engineering job? An industrial engineer’s job is to find the best combination of people, tools, materials, parts, information and power to provide products or services efficiently. In contrast to other engineering specialties such as civil engineering or mechanical engineering, industrial engineering track isn’t restricted to one industry or type of work. It may be industrial in the sense of working in a traditional manufacturing, mining or transportation environment. Or it can lead to work for a financial services firm, a government agency or a magazine publisher. 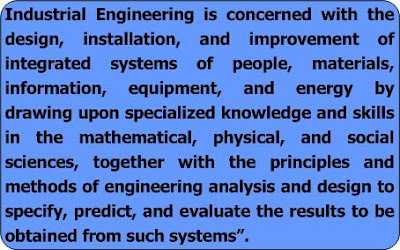 Industrial engineers research, analyze, model and test whole systems. They’re efficiency experts; safety engineers; ergonomics engineers; environmental health engineers; and in many cases, managers, principals or business owners. Al most any organization that you can name has a need for someone who understands what all the factors affecting its mission are, how they’re related, and what can be done to make it all work better. 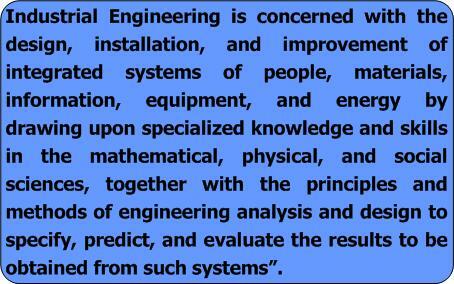 That’s what industrial engineering does – it makes a system, a process or an organization work better.